But while the high-profile summits between the countries’ elites showcased warming official ties, some low-key sports exchanges earlier this year will also have played their part in boosting trust and understanding following the president’s trip. In January, the U.S. State Department committed to a sports exchange program in which a delegation of Burmese youth came to the United States for a week of basketball activities. On their first night in Washington, D.C., the delegation met members of the Washington Wizards NBA team, before visiting a local high school in Maryland where they shot hoops with the varsity team. The Burmese visitors then traveled to Charlotte, North Carolina, where they met with Rich Cho, general manager of the NBA’s Charlotte Bobcats, a Burmese immigrant and one of the organizers of the program. One can only imagine what it was like for a Burmese boy to step onto the Verizon Center court and shoot baskets with NBA star John Wall. And although these types of exchanges don’t grab international headlines, they are the sort of activities that can do much to improve relations between long-estranged countries by creating positive memories, friendships and deep bonds between Americans and others through the universal language of sports. And the value of these programs is apparently recognized by the U.S. government itself. SportsUnited, a division of the U.S. State Department’s Bureau of Educational and Cultural Affairs (ECA) that is devoted to sports diplomacy, has been increasingly active over the past decade, bringing over 1,400 athletes from 65 countries to the U.S to participate in sport visitor programs since 2002. In 2005, it also created the Sports Envoy program under then-Secretary of State Condoleezza Rice, sending 250 U.S. athletes, including high-profile stars such as the Baltimore Orioles’ Cal Ripken and U.S. Olympic figure skater Michelle Kwon, as goodwill ambassadors to nearly 60 countries. More recently, I participated in a SportsUnited program this past summer, which hosted a delegation of wheelchair basketball athletes from Turkey. The team of national champions was taken to a practice session with the WNBA Washington Mystics, and to the National Rehabilitation Hospital in Washington, D.C. to meet with doctors to hear about injury prevention, rehabilitation and prosthetic options. In between the official appointments, the team did some sightseeing, shopping, and practiced for what turned out to be a nail biter of a game against NRH’s wheelchair basketball squad. The kind of goodwill that is generated at the micro level with these kinds of visits can truly underpin the progress made at the government level, especially as such programs are not just about sports – they also offer an opportunity for visitors to learn about U.S. society. Through the Turkey basketball exchange, for example, Turkish players gained an appreciation of the opportunities for handicapped athletes to thrive in the United States. This spirit is contagious, and past participants in sports programs have returned to their home countries to start similar initiatives. This isn’t to say that high profile sports diplomacy doesn’t have a place – “ping-pong” diplomacy back in the early 1970s famously helped kickstart relations between the United States and China. “You have opened a new chapter in the relations of the American and Chinese people,” Premier Chou En-lai reportedly told the visiting Americans at a banquet back then. “I am confident that this beginning again of our friendship will certainly meet with majority support of our two peoples.” The rest, as they say, is history. But such events are the exceptions rather than the rule. Effective sports diplomacy usually happens beneath the headlines, facilitated by those who believe that sports are a unique form of international interaction, where language is not a barrier. Indeed, just playing together on a court or a pitch can help young people build the kind of trust and understanding that regular politics can’t impose – fun, effective and without fanfare. We can't always understand the thinking of Dennis Rodman unless he explains it. Maybe Mr. Roman didn't like Dear Leader's uncle either. Rodman can explain anything if he appears to be high on camera. He could not even talk, apparently from being so high on coke or something. That guy is a charlatan. I like the North-Korean female looking on Dennis as if on someone fallen from the sky. It reminds me of the face of an African, on a film, when a bottle of Coca Cola falls from the sky at his feet. The look of that girl is astonishing! Rodman's always been an outlier. He's in like company. It's a pity that Kim had his uncle executed. The old man was wise and savvy, who would have enlightened his nephew. 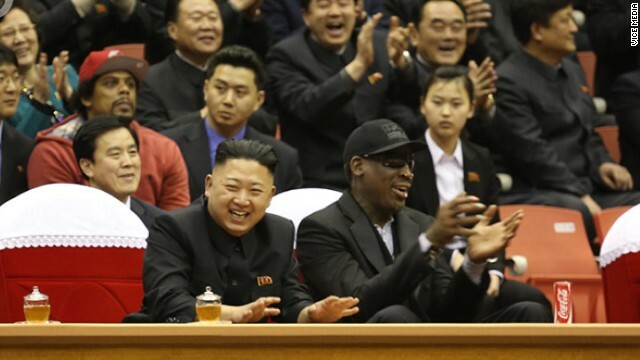 It comes as no surprise that he feels more comfortable in Dennis Rodman's company. Any graduate from an Ivy League college would bore him to death. I'z just sayin' more chickenz for ya'll. If wed had more chickenz no more problums. gotta be the fired chickenz thou. iz em grease tiples of ur arms and elbowz yo. What you be trippin bro! You know you needs them watermellons for the nutrence.